WEST HAVEN, CT- Northeast 10 Conference Tournament action kicked off across the region Tuesday night including the #1 seeded Chargers of New Haven hosting #8 UMass-Lowell in a quarter final. The Chargers had yet to lose a match in conference all season going into the night and had lost only one match overall since September 9th, but that did not stop the River Hawks from fending off their hosts for a 3-1 victory and tournament advancement. Set 1 opened with a back and forth between the two teams reaching a tie score of 8-8, but a 7-1 run by Lowell put them up in a commanding 15-9 position and despite a more even exchange again between the two teams, the advantage let the visitor’s pick up the 25-17 set win. For the River Hawks, points came from a variety of sources including several Charger attack errors early on, Anisa Smith picked up a kill, later Lea Freeman spiked the ball off the blockers and down, and she then launched an attack into a back corner. Brooke Peterson had one of her many service aces as she dropped a ball I short on the defenders, a few more kills out follow but a couple more attack errors added to their lead. Trina Carroll and Ella Merrill had a tandem block as well, Sierra Brown whapped a ball over the blocking line and to a gap, and Merrill used a more direct approach to hammer a kill through the block. Late in the set Smith placed a kill in a back gap which was not touched by the defender’s, Peterson careened a ball off the defense and out of play, and Smith and Peterson each added another kill. Kristine Wiltjer used a set to get the ball into a gap in the defender’s, and Freeman and Peterson totally shut down an attack with a block. The set would send just two points later. New Haven scoring included an early ace from Kaulana Ane, several attack errors by UM-L, a kill by Kristy Atufunwa to tie things at 8, later Keidy Candelaria added a spike in, Hayley Wilson then stepped back to serve and came up with the ace. A hard smash from Amber Cannady popped off the block attempts, and Chelsey Alpough redirected a set through the defensive line. Very late Candelaria would add a few more. Set 2 would find the Chargers in a hole again early as Lowell blasted out to a 10-5 lead. Carroll had a slew of early kills amidst the offense and Freeman whacked a ball just in bounds and followed it up placing a ball into a gap as well. Carroll then stepped in to serve and the Chargers did not return it. In this time Candelaria had added a kill though most of the UNH points were due to UML errors. Candelaria however broke the run with a huge kill, and Ane and Atufunwa’s block cut the deficit to the 3. Smith responded for UML, but UNH kept page, Freeman then knocked a kill off the blockers sideways, but Cannady responded for New Haven, and a kill out of bounds by the River Hawks cut the lead to 12-10. Merrill used varying approaches to regain a lead however using a light tap off the blocker’s hands, and then teeing up a tremendous spike to put the lead back at four. When a serve went out of play New Haven had a chance back into it, though Merrill closed it at that point with a another smash. Candelaria however spiked two straight over, though Merrill responded only to have Candelaria strike yet again. After an attack sailed out of bounds from the hands of a River Hawk, Alpough served up an ace tying the score at 16-16. Carroll and Freeman each picked up a kill, followed by Freeman and Smith sharing a block to put Lowell quickly back up by 3, but Atufunwa won a battle at the net to keep the deficit at 2. Two straight River Hawk points made the score 21-17 making things quite perilous for the Chargers. They regrouped during a time out and Margo Meteyer smacked one off the blockers and out of play, Cannady picked up a block which ricocheted off 3 players and hit the floor, UML had a double contact error and Candelaria punctuated things with a service ace to tie it at 21. A spike out of bounds returned the lead to Lowell, but Meteyer’s rocket ended a very long back and forth. New Haven had a miscue returning an attack, but Candelaria tied the set up quickly at 23-23. Merrill regained the lead for Lowell, but that would be the last point they would score as Candelaria came up with two more kills and an errant UML attack ended the set 26-24. Now even at a set a piece the two teams continued to battle back and forth in set 3. After reaching an 11-11 tie, the Chargers appeared to be pulling away getting out to an 18-12 lead thanks to two kills from Meteyer a block from Alpough and Cannady, and a kill from Candelaria, but Carroll landed an attack just within the lines, an attack error by UNH, a block from Carroll and Smith, and another block from Peterson and Carroll cut the deficit to 2, and a time out was called. UNH was still clinging to a lead though in part due to Candelaria’s efforts and held until 21-18 before Freeman teed up a kill that was not returned. Peterson stepped back and had a service ace, a four contacts error tied the set up, and Peterson served up another ace to take the lead back 22-21. New Haven would not score again as they attack out of bounds, Freeman put down the ball, and one point later it was 25-21. Earlier offense had come for the Chargers from Meteyer, huge spikes from Candelaria and Ane, another from Candelaria that threaded it’s way through the defenders, a big block from Atufunwa, another kill from Meteyer, a wallop from Cannady and later a cross court kill at the net, Meteyer had two in a row including one that set off their lead. Lowell had picked up early points from kills from Merrill, Peterson, Freeman, an ace from Kiana Raposo, and a huge kill from Merrill several points later, Peterson set the ball into an area the defenders couldn’t set up a return to as well. Down 2-1, Lowell had the advantage going into set 4. The two teams would once again start fairly evenly all the way to a 12-12 tie. Lowell had picked up points from the usual sources like Merrill, Peterson, a block from her and Freeman, a kill from Freeman, ace from Peterson, another success from Freeman among other things. UNH’s Cannady hacked the ball off the blocker, Candelaria tapped the ball over the front line, Alpough set the ball to Cannady and she smashed it, and then did the same on the next point too. Hayley Wilson’s service ace tied things up as well. But Lowell would pick up 7 unanswered point. Smith started the run slamming a ball off the blockers and straight down, she then went through them, Merrill’s serve hit a defender and kabonged way out of bounds, the Chargers committed an attack error, and then Merrill added insult to injury with another service ace. The run was finally broken with a serve out of bounds, but Smith and Brown shared a block immediately after to put the score at 18-13. Candelaria came up again with a spike, but Freeman put a ball down, and Raposo served up two straight service aces. At 21-14 a time out was called, and the Chargers did pick up a pair of points, though Wiltjer stifled that run with a backhanded kill. A double contacts error kept New Haven within 5, but Freeman’s block and another kill from Merrill made it match point 24-17. Alpough set the ball to back center and Lowell committed two straight attack errors but with hopes of a comeback rising Brown ended it with only her second kill of the day, 25-20. Looking at the box score posted by the sports info, Merrill led Lowell with 14 kills, Freeman had 13, Smith 7, Carroll 6, Wiltjer and Peterson 4. Wiltjer also had 37 assists on the day, libero Carolyn Eddy had 16 digs, Peterson 14, and Merrill 11. Freeman had the lone solo block of the day, but participated in 3 others. Smith was part of 4, Carroll part of 3 as well. Peterson had 5 service aces on the day, Raposo 3, Merrill 2. For New Haven, Candelaria had 21 kills on the day, Cannady had 10, Meteyer 6. Alpough had 37 assists on the day. UNH platooned liberos with Wilson and Ashley Gomez both in the role, each had a few digs on the day though Candelaria and Ane had 16, and Meteyer 15. Atufunwa had a solo block and shared another. Cannady participated in 3 tandems. Wilson had 2 aces, and 3 other players had 1. Karen McNulty’s squad heads on the NE-10 semi-finals, while Robin Salter’s New Haven team, by virtue of their record, will be waiting to see where they land when NCAA Tournament selections are announced. Editor’s Note: This is based on notes taken at the match, verified against the official play by play if possible. (Official box score was posted here by sports information.) Reports focus on offense since it is easier to track but note defensive play whenever possible. 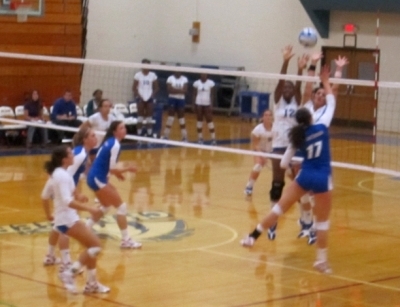 It is difficult to note things like digs and assists although they are no doubt vital to the game. Also, a lot happens in a volleyball game, far more than can fit into a report, so this just notes some of it.